While the mountains define Jackson County, there’s no question that its many streams are a huge part of its appeal. Best known, of course, is the mighty Tuckasegee, the river that runs south to north through most of the county. Scenic N.C. 107, Jackson’s main state highway, runs beside the Tuck for most of its length as it connects Cashiers with, in “down-the-mountain” order, Glenville, Cullowhee, and Sylva. But the Tuck is not the county’s only river: three others – the Chattooga, Whitewater and Horsepasture – drain Jackson’s southern end, and the Oconaluftee flows through its northern tip. Five may seem like a lot of rivers for one county, but to get the total number of named streams in these parts, you have to multiply by 50. Counting all the rivers and both forks of the Tuckasegee, a manual tally from topo maps reveals that there are 250, meaning Jackson has about 65 more named rivers, creeks and branches than it has mountaintops. 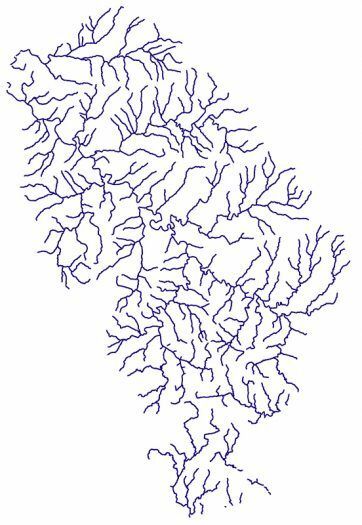 When it comes to named tributaries, the Tuck wins hands down, having almost seven times more creeks and branches (192) emptying into it as its nearest rival, the Oconaluftee (26). And an examination of the territory just beyond our county reveals that the Oconaluftee is actually a tributary of the Tuckasegee, with the two rivers’ waters converging just a short distance after the Tuck flows into Swain County. The Tuckasegee’s largest branch is its East Fork, which flows out of the county’s Canada section. Some 42 named streams flow into it, as well as quite a few branches that the map doesn’t name. Of the East Fork tributaries, three – Tanasee, Wolf and Bear – lend their names to lakes and powerhouses that generate electricity. Built during the 1950s by Nantahala Power & Light Co., the projects are now part of Duke Power’s system. In second place is the Tuck’s West Fork with 32 feeder streams. Duke’s largest local hydro project, which consists of Lake Glenville and the Thorpe generating station, is on this branch of the Tuckasegee. Taking third place is Scott Creek, the stream that runs through downtown Sylva. From its headwaters in the Plott Balsams to its confluence with the Tuck in Dillsboro, Scott Creek has 28 named tributaries. Many of these do double duty and lend their names to the roads that follow them. Cope Creek, Allen Branch, Kitchens Branch, Monteith Branch, Fisher Creek, Blanton Branch, Parris Branch, Buff Creek, North Fork, Sugarloaf, Dark Ridge and Woodfin all fall into this category. Though one might guess Caney Fork would closely follow Scott Creek with regard to the number of tributaries, it’s actually Savannah Creek that’s in fourth place with 22. Again, there are a lot of road names here, including Cagle Branch, Sutton Branch, Brooks Branch, Greens Creek, Brushy Fork, Peewee Branch, East Fork, Long Branch and Little Savannah. Caney Fork ranks fifth, with 21 smaller streams flowing into it. Among the best known are Sugar Creek, Johns Creek, Brasstown, Moses Creek and Chastine Creek. Cullowhee Creek is a distant sixth with 11 tributaries. Duplicate creek names are not unusual, even on the same river system. “Long Branch” is a popular name: there’s one in Dillsboro, one in Cullowhee, one that flows into Savannah Creek and one that flows into Canada’s Wolf Creek. There’s also a Wolf Creek on Cullowhee Mountain that flows into Cullowhee Creek. By the time it reaches Dillsboro, the Tuckasegee has already gathered most of its water. Of its almost 200 feeder streams, only 25 more join the river before it flows out of Jackson County. Jackson’s many streams provide almost unlimited recreational opportunities to its visitors. Many, including the Tuck through Webster and Dillsboro and Scott Creek in Sylva, are part of the county’s famed WNC Fly Fishing Trail®. Whitewater rafting is available on the Tuckasegee, and the lakes offer boating, fishing, swimming and water-skiing. Many hiking and walking trails, such as the ones in Sylva’s Pinnacle Park, follow streams for part of their distance, and several short trails access waterfalls, including Silver Run Falls, Dill Falls and spectacular 411-foot Whitewater Falls. Whether your water-related vacation goal is fishing, boating, kayaking, rafting, floating, swimming or waterfall-looking, Jackson County’s beautiful streams can take you there.